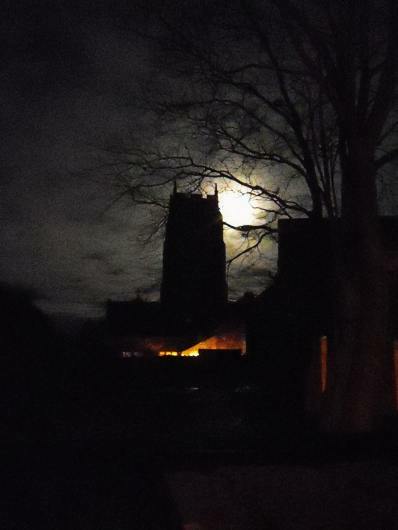 The casual visitor, having seen the fine fifteenth century tower from the coast road and deciding to investigate, may be surprised at the simplicity of the interior of the Church of St. Mary the Virgin, Holme-next-the-Sea. 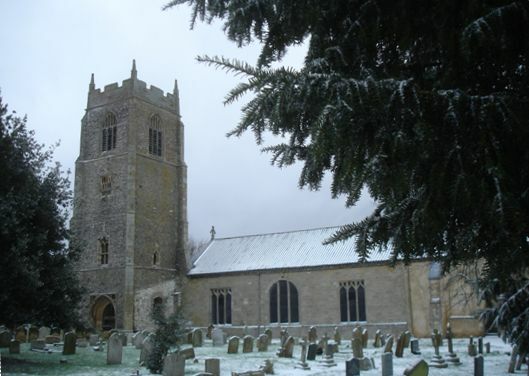 The first mention of a church in Holme-next-the-Sea is in 1188 but nothing is known of this building and it was not until the first half of the fifteenth century that the story of the present church began. Henry Notingham, who was a judge of assize in the reign of Henry IV (1399 - 1413) and a member of the council of the Duchy of Lancaster, was responsible for the building of the tower and the original chancel of a church which had a north and a south aisle and a longer nave than the present one. It can be seen, from the position of the tower in relation to the church today, that the original nave extended as far west as the west wall of the tower. The south jamb of the great west window can still be seen outside and in the inner porch. Outside, on the east wall of the tower, the roof line of the former south wall and the end of the aisle wall are clearly visible. On the north side of the tower is the blocked-up lancet window of the ringing chamber, which formerly looked into the church. Through this unglazed window the ringer could hear the service and would know when to ring the Sanctus bell. It seems that over the centuries the cost of maintaining such a large building was more than the parish could bear and it evidently fell into disrepair. At a Vestry meeting on 8th September 1777, it was decided to demolish the remains of the nave and the whole of the north and south aisles and build a smaller church. In the following year the nave, without aisles, was rebuilt and the chancel extensively repaired, using materials from the walls and windows of the old north and south aisles. It was at this date that the east window was constructed. It was re-leaded in 1997. Unfortunately the building was again in a bad state by the third quarter of the nineteenth century, possibly due to inferior workmanship in the eighteenth century rebuilding. The roof leaked, there was no roof to the inner porch and the glass in the nave windows was cracked, broken or had entirely disappeared. On the election of Mr. James Nelson as churchwarden in the early 1880s, restoration work was put in hand. The roof was cladded and repaired, the flooring renewed, the present seating, which replaced the old box pews, was installed and the external walls of the chancel were rendered. In the mid 1990s, when this render was removed, arched stonework was revealed on the south wall indicating that the wall was originally internal, forming part of an arcaded south aisle. Stonework forming an additional window was also discovered. These features, previously concealed, were preserved when the chancel walls were re-rendered. At the same time, excavation on the north side of the church uncovered foundations proving the existence of a north aisle. Both the font and the pulpit date from the Victorian period. In recent years the slate roof has been replaced with brown pantiles and extensive restoration work carried out to the tower. In 1961 the inner porch was rebuilt and in the window are some old stones, discarded during an earlier reconstruction, which were still lying in the church. Henry Notingham's splendid tower dominates the main entrance of the church with the remains of an old scratch sundial immediately over the entrance arch and unusual windows above. The tower is 76 ft 6 ins (23.3m) high. The brick parapet probably dates from the sixteenth century. 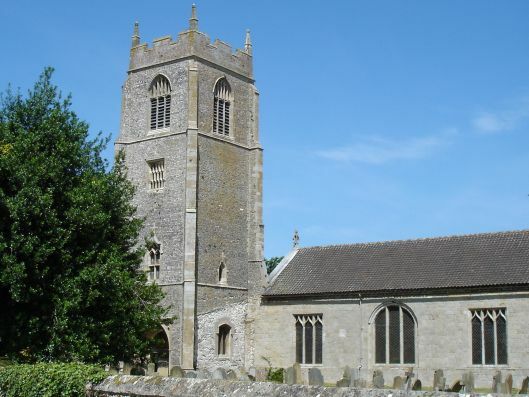 The tower houses a peal of five bells dating from the seventeenth to the nineteenth century. The interior of the outer porch under the tower is vaulted, with carved bosses and moulded ribs. There are four shields at the intersections, three are blank and the fourth bears the arms of Henry Notingham. On the keystone is the monogram HN interwoven in a circle. There has been some wanton damage in the north east corner of the old porch, possibly caused by the removal of the holy water stoup by Cromwell's troops. This also applies to the original figure of Our Lady in the niche above the doorway, the fixings of which could be seen before the present figure was placed there. This was carved by Esmond Burton in 1961. A very similar, though larger, figure is in Ripon Cathedral, where Esmond Burton also carved 32 figures for the empty niches in the fifteenth century choir screen. In the inner porch, over the doorway on the left, is a carved head of Henry Notingham which originally formed the apex of the tower window above the entrance arch. 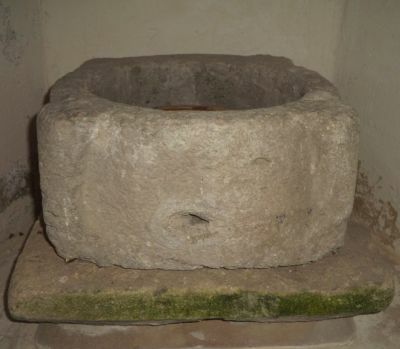 In an alcove are the remains of the basin of an old font supported on a drainage stone. On the right of the doorway into the church is the font with marble basin and stone pedestal, which was in use until 1885. The old chest is inscribed "March ye 26 1689 Sam. Stibbert fecit". On the wall above the west window is a stone referring to the rebuilding of the nave without its aisles and it is inscribed "John Holley, Churchwarden, 1778." His grave is in the centre of the nave. A board higher up referring to the 19th century restoration states "1887. Reseated and restored in the Jubilee year of Queen Victoria. F.D. Rev. C.E.Browne, Vicar, James Nelson, F.Green, Churchwardens, W.Adams, Architect." It is easy to completely miss the west window which is located high above the inner entrance door to the Church. This Victorian painted glass window, depicting the three Virtues, Faith, Charity and Hope, was designed by Mrs Matthew Nelson in memory of her husband. Above the window, picked out in gold coloured glass, is the legend "And now abideth Faith Hope Charity these three but the greatest of these is Charity". Below the three panels of the window can be seen the dedication "In loving memory of Matthew Nelson - died Oct 23rd 1874 aged 57". The window is signed "Painted Jane A. Nelson 1888". 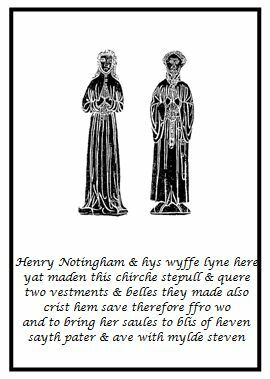 In the church the object of greatest interest is the brass to Henry Notingham and his wife. 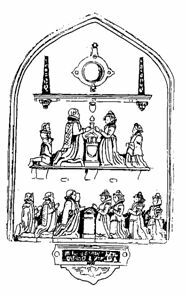 Their tomb was originally in a chapel at the east end of the south aisle. The grave (the exact site of which is not known) is now in the churchyard, as a result of the aisle having been demolished. The brass is now fixed to the wall on the south side of the chancel arch and is thought to be an important London-made brass, which is earlier than the many Norwich-made brasses found in Norfolk. This brass was voted "Brass of the Month" in February, 2004 by the Monumental Brass Society. Click the link for lots more detailed and historical information. Immediately below the Notingham brass is a second small one inscribed "In hope of joyefull resurrection hereunder lyeth the body of Barbara Strickland, the wife of William Strickland of London, grocer, and daughter of Richard Stone of Holm and Clemens his wife". She died on 15th December 1582. It is of special interest because when it was reset on this wall it was found to have a part of the lettering and canopy of a large continental brass on its reverse side. This was reused and is called a palimpsest brass. It could have come out of an Abbey or a monastery at the Dissolution in the reign of Henry VIII. from the demolished north aisle. In a blocked-up window in the south wall of the chancel, to which position it was moved during the 1778 rebuilding, is an incomplete canopied alabaster monument to Richard Stone and his wife, containing a delightful group of figures. In 1887, when the new seating was installed, the tomb of Richard Stone was found at the south side of the nave near the chancel arch but it was covered over again and is under the lectern and first three pews. There are two Hanoverian Coats of Arms in the church, one in the chancel (dated 1779) and one on the north side of the nave. In the church there are a number of grave slabs of members of the L'Estrange and Holley families. Members of both families were patrons of the living at various times. 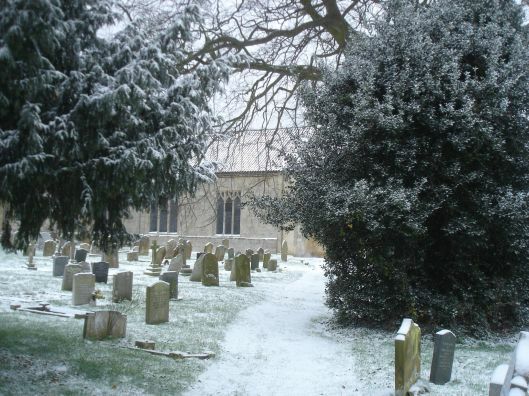 In the churchyard there are many graves of members of the Nelson family, who lived at Holme House. The Holme-next-the-Sea branch of the family was descended from the elder son of Edmund Nelson of Wendling, Norfolk, whilst the Admiral was descended from his younger son. There is an interesting, although distant, connection between the Nelson family and that of Napoleon Bonaparte. 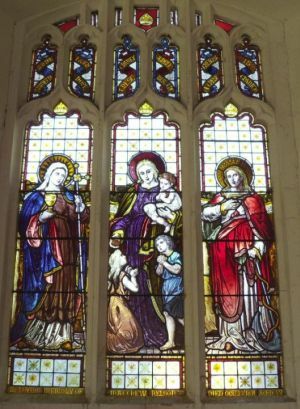 The mother of Mrs. Matthew Nelson (who designed the west window in the church, described above, in memory of her husband) was Ann Jane de Clerc, a niece of General de Clerc, the first husband of Pauline Bonaparte, Napoleon's sister. As an obituary notice in "The Queen" of 15th January 1887 put it, "thereby were united the families of the two greatest naval and military commanders the world has ever seen." 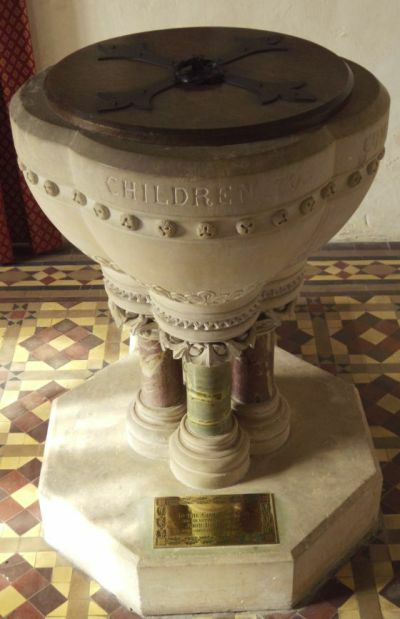 The first, and oldest font, is located just inside the entrance porch. This rather primative example is still resting on a drainage stone. Also in the entrance porch, on the right of the main door, is a tall font consisting of a marble basin on a stone pedestal. This was used until 1885. The font in current use is Victorian and is made of Bath stone with pillars of different colours of Irish and Devon marble. It was given to to the Church in 1885 by Mrs. Holley in memory of her husband, the Rev. John Holley. Please click on the poppy for more information.